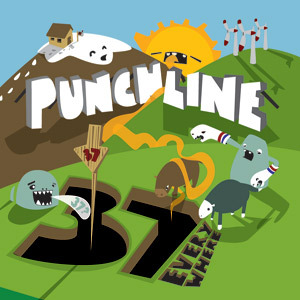 This week I’m reviewing Punchline’s 2nd album: 37 Everywhere. I discovered this Pennsylvania-based pop punk band after listening to their single Not Afraid on some random emo sampler back in the day. Worth Your Time? Of course! Twitter Review: 37 Everywhere is a solid well-crafted pop punk album with a nice mix of intensely delivered dark topics and uplifting messages throughout. Wonderful Writing. There’s actually a lot of clever lyrics using a combinations of metaphors and play on words. I think the darkness described in Flashlight is actually talking about hitting rock bottom with drug addiction. I believe the entire song is about the frustrations of dealing with a friend or loved one who is a drug addict. In Don’t Try This At Home, it includes the lyrics “The backseat’s a dream when you’re just 18 but the dreams take a back seat so fast.” I think this perfectly alludes to the difference of your carefree late teen years when your parents are still shielding you from being an actual adult and the stark reality that hits you once you finally are on your own. I think a lot of people gain a lot of respect for their parents once they become an adult. The entire songs compares growing up to a reality television show. The title even plays on a common TV phrase usually reserved for dangerous stunts by shows like Jackass but instead reserves it for something all of us eventually have to do one day which is learn how to survive on our own. Caller 10, despite it’s upbeat tone for the majority of the song actually ends on a tragic down note questioning how much of falling in love is left up to fate and how much is our own responsibility. Exactly covers a fairly introspective topic of the process of losing your energy and ideals of youth as you are absorbed into the compromised world of adults. It’s easy to write a pop punk song about always staying true to yourself and doing what you believe. It’s a lot harder to capture what happens when that gets applied in the real world and the fallout that follows. Steve Soboslai is definitely a lyricist I respect. Emotional Intensity. I think the spoken word part found at the end of Exactly shows just how far these guys will go. But even the background vocals of Green Light and lead singer’s delivery in Wars Will Always Happen convey the intensity that Punchline brings to the game. Hooks, Riffs and Choruses. Punchline is more infectious than a room full of kindergarteners in late October. It’s pretty hard not to sing and hum along after you listened to the songs a couple times. Low Points: At 38 minutes, I wish the songs were a little longer or there were more songs but it’s about standard for pop punk albums. I also noticed some song structures similarities but nothing even remotely close to what Staind does. Their more straight forward relationship songs are probably at the bottom of the list for me but even they still come with an incredibly catchy chorus. Anything Else: The name of this album comes from some of the band members obsession with seeing the number 37 everywhere on a daily basis. They claim if you look, you will be surprised how much you find it. Here’s a post of Chris Fafalios explaining it. To go along with seeing a certain number everywhere, I watched Joel Schumacher’s The Number 23 shortly after I bought this album. It’s worth watching in the same way it’s worth watching Schumacher destroy the Batman franchise: so you can say you survived a Joel trainwreck. Finally, the album is dedicated to John ‘Beatz’ Holan, Bayside’s drummer who unfortunately died in 2005. He is mentioned by name in the song They Are Strong Hands which has a pretty intricate plot for a low budget music video. What’s Up with Project Lt. Morning?